Yay! Another one of the 26 ... DONE! 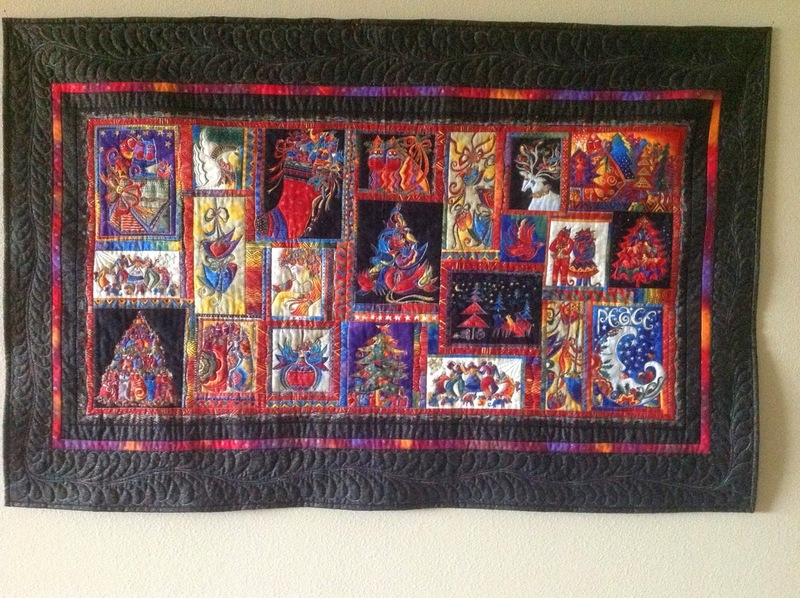 It's now hanging on the wall in my sewing room/guest room and I do not care that it's past the season. 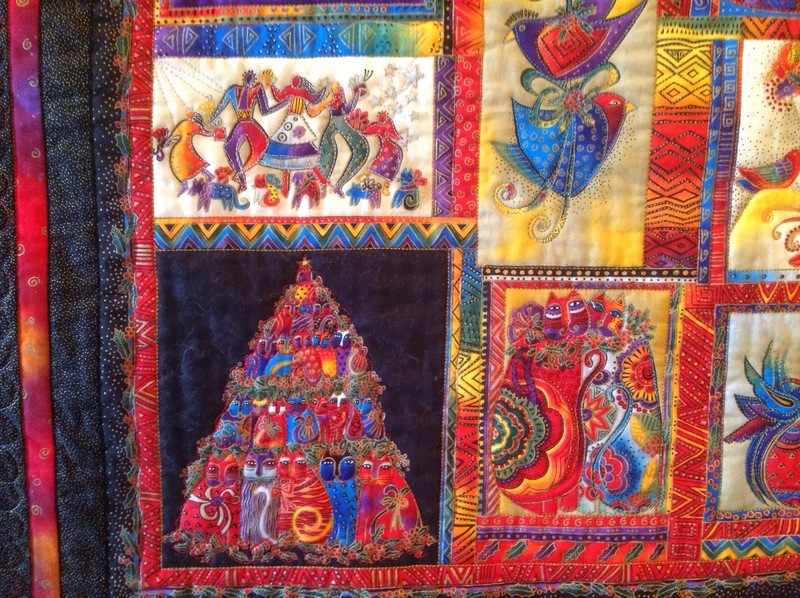 Even my husband said it's a cool quilt when I hung it on the huge wall for pictures. 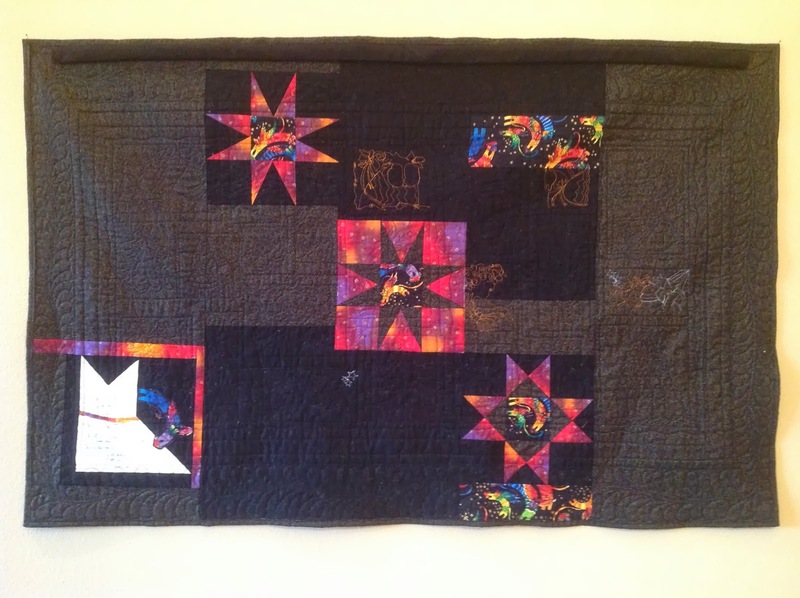 We both agree that it is sad that the panel was not printed square, but all in all, I am so happy that I persevered (well, we won't talk about the few, ahem, several, years it sat in a drawer or hung on my design wall as I both avoided and loved it. And the end result? I just love it. I have TONS of pictures of it, and I hope they show off all the FMQ, since I do not have photography lights, and it's raining outside today, so scratch the natural lighting idea too. These are all taken with my iPad. 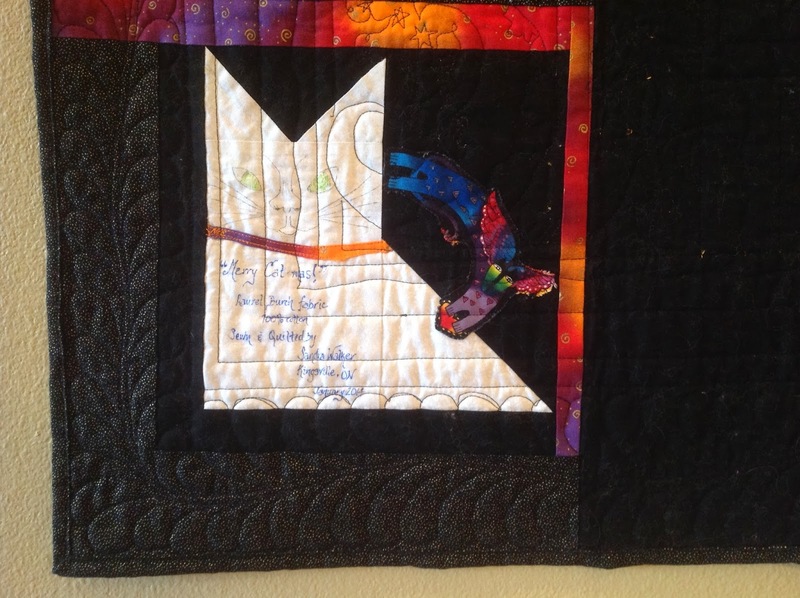 Interesting how there is a ray of natural light showing on the left side of the quilt in the above picture! 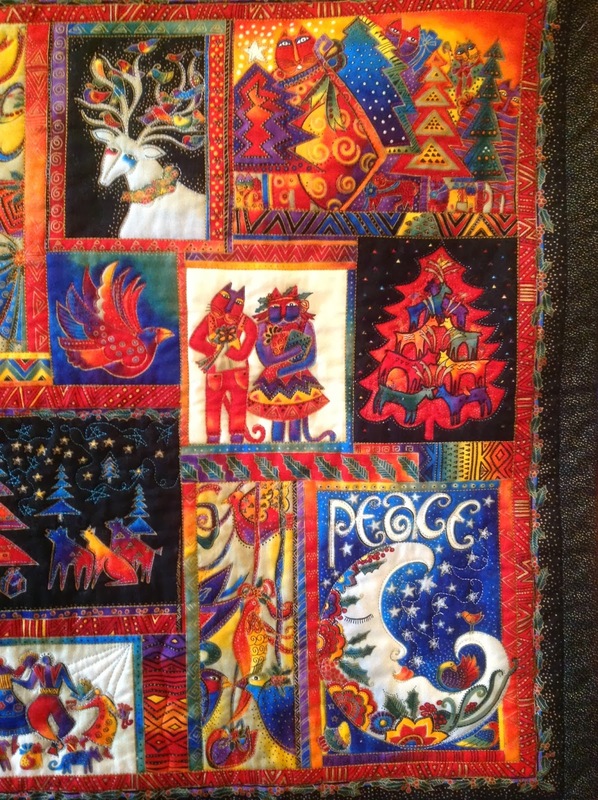 "Merry Cat-mas" measures 51 X 32.5". 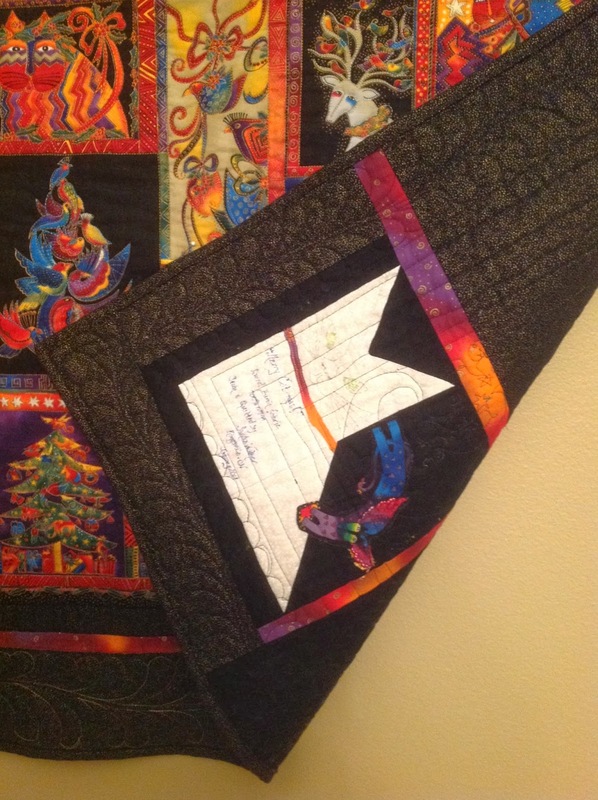 I put to use once again, the knowledge and confidence I gained from taking Angela Walters' Free Motion Quilting with Feathers class on Craftsy, when I decided to just go for it and freehand quilt them. I did the custom feather; she teaches you several different ones in the course. I even used a variegated thread so they would pop even more, just took a big breath and went for it! 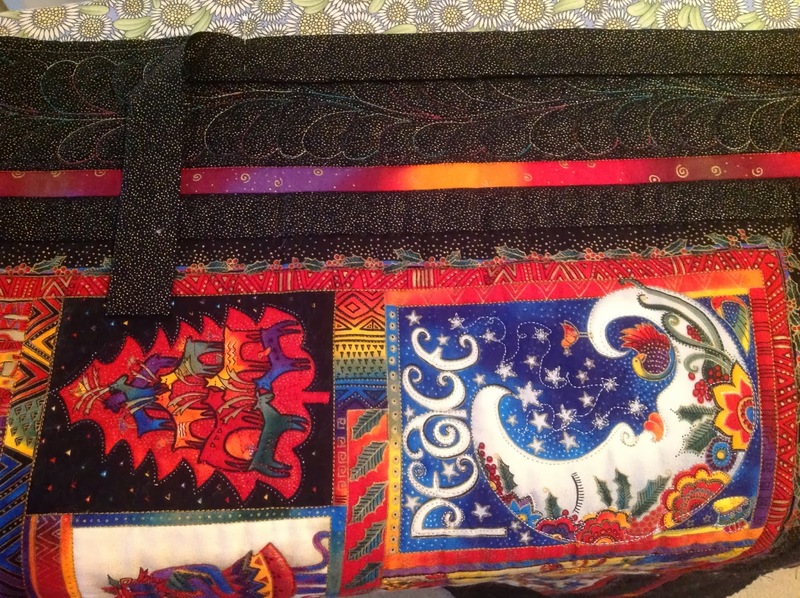 I used Aurifil 3817. I'm really happy with how it turned out. 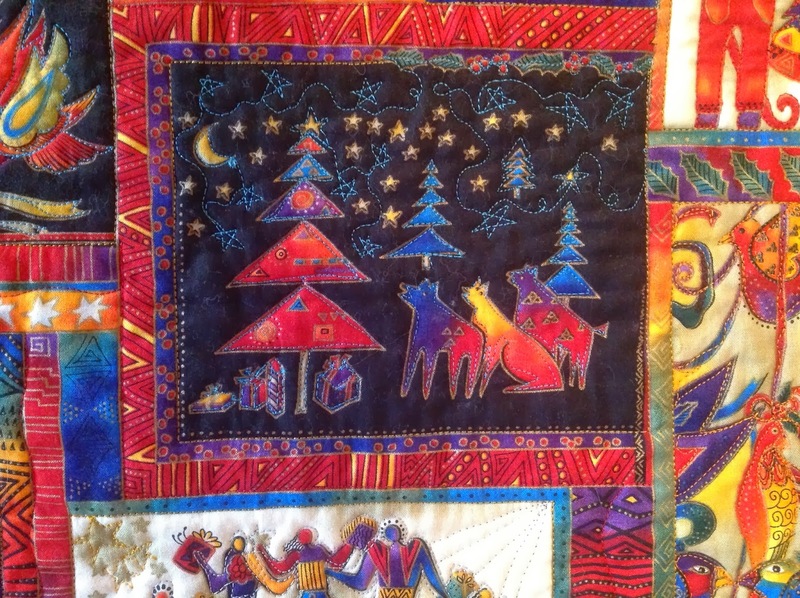 The panel quilt pattern, by Laurel Burch, is called Holiday Cards. There are 23 'cards' to the panel. I FMQ'ed each one. 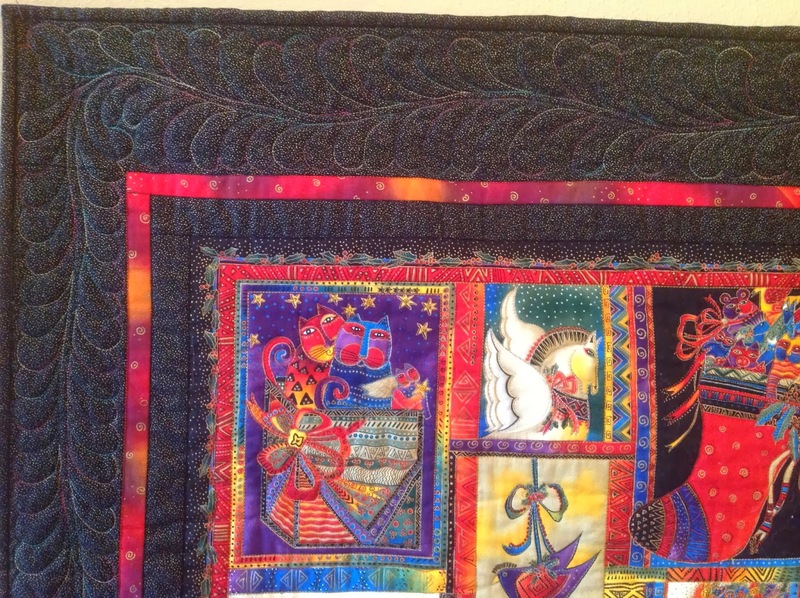 First of all I put on my walking foot, and stitched in the ditch in three places: where the panel meets the first border of black sparkle fabric, and then along both seams of the fiery-coloured zinger. I also stitched the frame of each card. Then, it was fun-time! I went to town. Don't you just love the two flower-covered cats? And that tree made up of.... CATS! Love it. This girl (goddess) kissing a bird was interesting. I remembered Leah Day's fabulous hair on her "Express Your Love" goddess, and, although this girl has a very small amount of hair, thinking of Leah's goddess made me want to accentuate her hair strands rather than just outline the edges. So I did, and I love it. 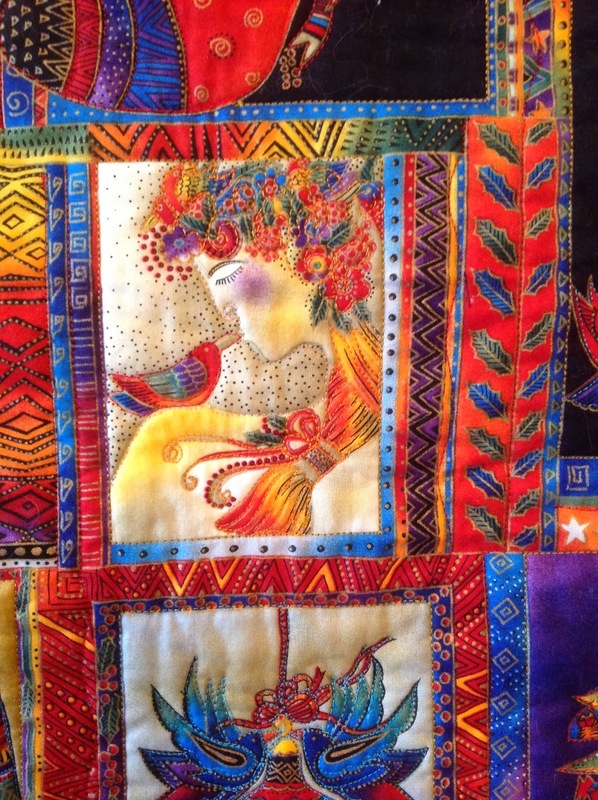 For the flowery parts of her upper head, I started outlining and then I decided to do miniature spirals similar to what they have been doing this week in the Free Motion Quilting Project. I handled each tree differently. 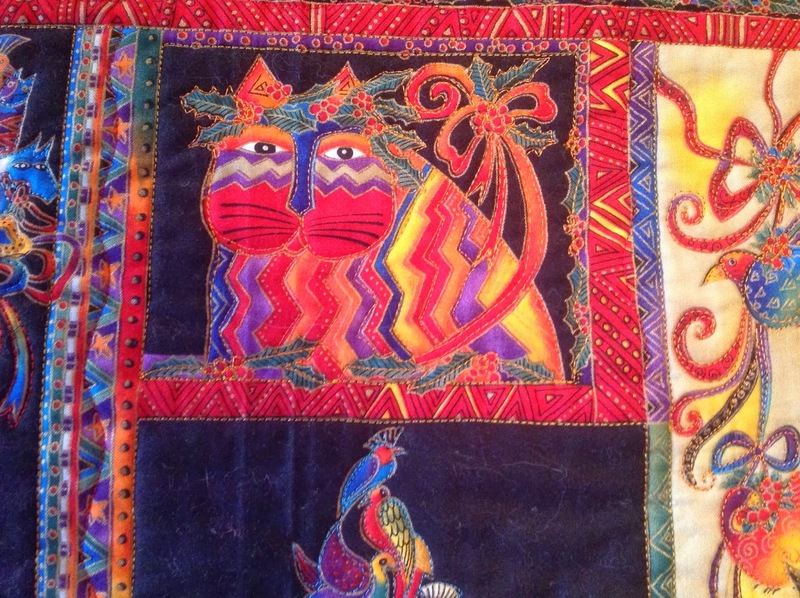 For the one made of cats, I quilted each cat's outline (phew!). For the green one at the bottom in the above picture, I picked 5 of the animal ornaments and outlined them. 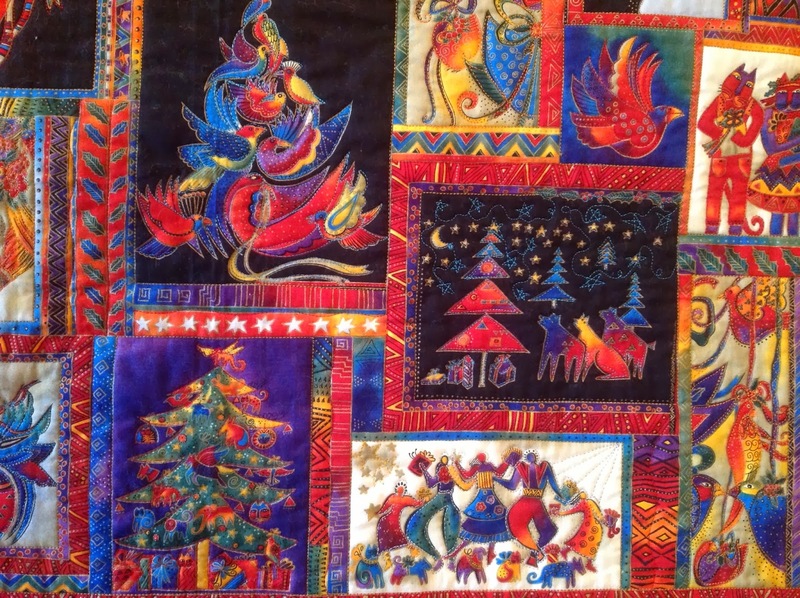 For the tree made up of birds, I quilted each bird as well as the ribbons. I got more adventurous with thread colour as I worked my way through each card. My favourite kitty on the panel. 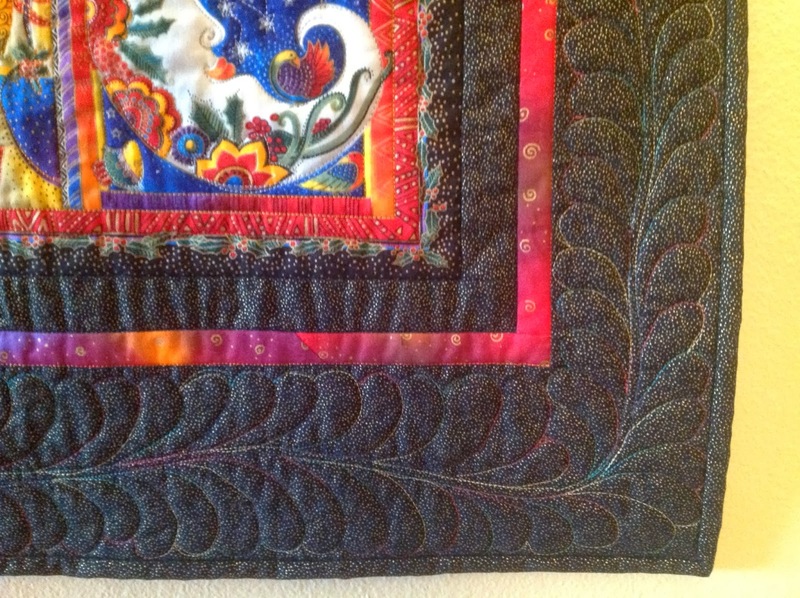 Quilted with orange Sulky rayon. THIS was adventurous for me: using the same orange rayon in the bobbin so you see the cat on the back! I love her. Yes, more adventurous on the front as well as the back! 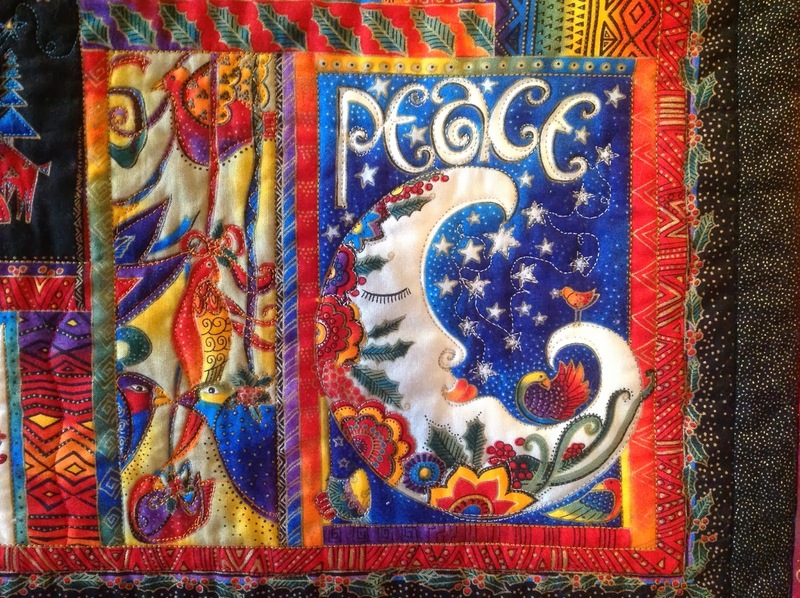 Angela Walters did this on the latest quilt she posted about. I am going to do this too...very soon I hope. For the tree of reindeer you see here, I outlined it, and then simply echoed the tree outline inside, rather than outlining each of the reindeer. Howling wolves...so cute. Bet they're howling "Hallelujah!" Again, I got a little more daring, using a Gutermann turquoise rayon and instead of outlining some of the gold stars, I did a loopy loose stipple with stars. I love the peace moon, placed in a restful bottom corner of the panel. I used Madeira silver polyneon here, and then in a few other cards of the panel. Here is the back! You can see a few other cards where I tried matching the bobbin to the top thread. That ray of light kind of shows up on the left in this picture too! The black skinny strip at the top is the hanging sleeve. And there's the label I made. You can read about it, as well as the construction of the back here. I decided to machine sew the binding down. 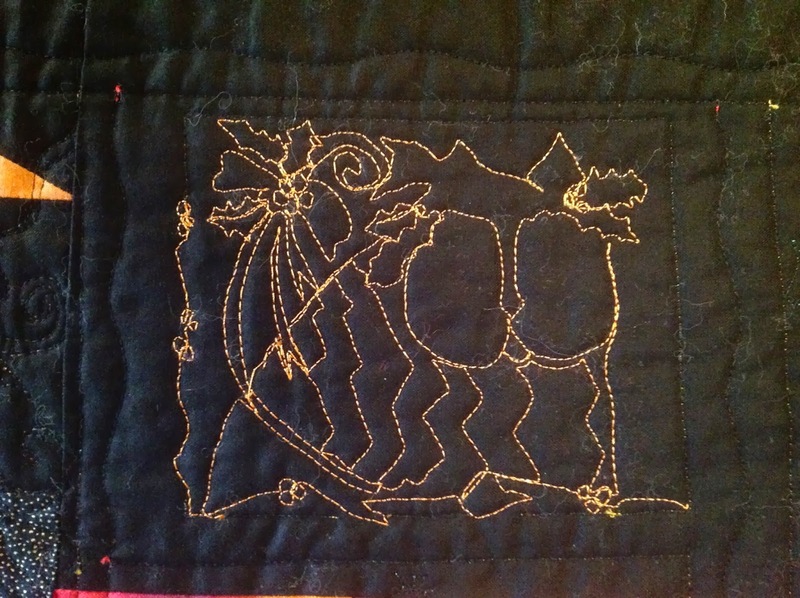 I almost always sew my bindings down onto the back by hand, but I thought I'd like to get the quilt DONE, and because it's a wall-hanging where one doesn't see the back (however, I will definitely be showing people this back!) I'd sew it down by machine. It worked quite well, and I did a pretty decent job, though it doesn't give as smooth a finish as hand-sewing would. It's such a good feeling to have it finally done and hanging on the wall. I am linking up today with Leah Day for FMQ Project Link Up. One of these days I hope to figure out how to get her button on my blog.